A strong wind whipped in heavy grey clouds, and the threat of rain was imminent as several hundred shivering people queued up at the edge of a woodlot north of Shelburne at the beginning of a unique demonstration of civil society. They were lining up to protest against the proposed “mega-quarry” in North Dufferin County’s Melancthon Township and to raise funds to fight the application and to celebrate the area’s farmland and the food it produces. Eight hours and 28,000 people later, world-renowned chef and president of the Canadian Chefs’ Congress Michael Stadtländer had pulled off the coup he had planned: Foodstock, with 100 top chefs from across Ontario and beyond and an army of local volunteers. Like most who attended Foodstock, I drove two and a half hours on roads and highways made of the very stuff that was the reason for this protest journey of thousands of Ontarians. The proposed quarry, which would be North America’s second largest, is the most recent in a long history of pits and quarries that have stirred public outrage. But this project is astounding in the way that the land was acquired from farmers and its sheer size and scale. The quarry would spread across 2,135 acres (937 hectares) and be almost 80 metres deep in places, bringing with it the spectre of major loss of some of Ontario’s best farmland, threats to ground and surface waters, and loss of wildlife habitat and other natural heritage. Irish rock band U2’s 1987 song “With or Without You” could be the theme song for society’s relationship with the aggregate industry. As long as the population in this province continues to grow, we will need to feed it with the raw material for constructing roads, buildings and other infrastructure. Apparently, we can neither live without stone, sand and gravel nor live with the way these materials are produced. Or could we? Aggregate Forum’s flagship initiative, a voluntary certification program based on rigorous environmental and community standards, has the potential to be a game changer, raising the performance bar well above the level required by regulation through creative and collaborative problem-solving and innovation. 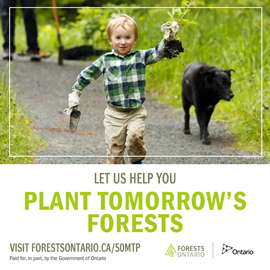 Ontario Nature is a founding member of the Aggregate Forum. Over many years, we have fought the granting of specific aggregate extraction licences and worked to change legislation to protect natural heritage from the impact of pits and quarries. Now we are looking for something different. With more than 3,000 pits and quarries currently licensed in Ontario and many more in the pipeline, we need systemic change rather than fighting one-on-one battles. Sitting down with this industry to figure out how to make it “green” has been an interesting challenge but is an investment that may in the end reap great rewards. 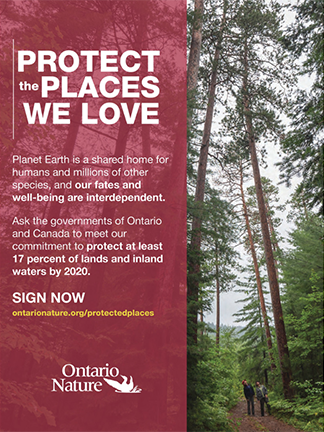 There will always be a need for occasional David and Goliath battles, such as the one in Melancthon Township, but we hope these will become increasingly rare – not because environmentalists and communities are depleted and defeated but because we have found a better way to protect our communities and environment. Mining of aggregate is necessary to fuel development and growth. I am just looking for somebody – anybody – to explain how “growth” improves the quality of life for humans and animals alike. People will argue that growth creates jobs. And it’s true, until you stop growing – then what? Are there an infinite number of acres in which to grow. Surely there must be somebody, somewhere who has thought this through in terms of providing enough food and sustainable employment for future generations? Perhaps Jonie Mitchel had it right all those years ago with her Big Yellow Taxi.